Fortunately for non-Muslims, who have neither the time nor the inclination nor the scholarly competence to get into intra-Muslim theological disputes, we do not need to figure out whether ISIS or [their theological opponents] more properly interpret these passages. We just need to know that ISIS reads the texts the way it does, believe them to be divine commands, and acts accordingly. Knowing this, we are better able to plan whatever military response is necessary to defeat them, and hopefully destroy them entirely. This is both theoretically and practically an easier task than debating them. There are two separate issues at play here that need to be clearly distinguished from each other before the United States crafts any strategy to defeat ISIS. The first is what, if anything, the United States should do over the short term to stop and then reverse ISIS's advance. The second is how the United States should approach the long term threat posed by Salafi-Jihadist terrorism and the ideology that inspires it. Inasmuch as the goal of American policy is grounding ISIS into the dust, then Michael is entirely correct. Conquerors the world over have shown that one does not need a nuanced understanding of an enemy's belief system in order to obliterate him. But ISIS is only one head of the hydra. If the goal of American policy is to permanently defeat “global extremism” or “global terror” or whatever the folks in Washington have decided to call Salafi-Jihadist barbarism this month, then this view is insufficient. I should be clear here. I am not advocating a perpetual, open-ended war declared against some nebulous concept like "poverty," or "drugs," or "terror." James Madison once declared that war is the "most dreadful" of "all public enemies to liberty," and I take his warning seriously. We cannot continue on an indefinite war footing without permanently damaging the integrity of the America's republican institutions. But there is more to this conflict than America's internal politics. It is worth it to step back and remind ourselves of exactly what is at stake in the global contest against Jihadist extremism. We cannot “win” this fight, in the long term, unless we can discredit the ideology that gives this fight teeth. Luckily for us, this does not require discrediting a fourteen hundred year old religion held by one fifth of the world’s population. It is worth reminding ourselves that the ideology we seek to discredit is a comparatively new one. It was born in the sands of Najd shortly before Arabia became “Saudi,” crystallized in its present form only in the 1960s, and was not exported abroad until the late 1980s. The Israeli-Palestinian conflict excepted, almost all "Islamist" terrorist attacks can be linked directly to this new Salafi-Jihadist ideology and the madrassas and proselytizing media used to spread it. It is an ideology that directly threatens the sovereign rulers of every country in the Near East, and one whose interpretations are not only opposed by the majority of Islamic theologians, but have little relation to the way Islam was practiced in most places a mere 30 years ago. That an ideology is new or rebels against established world views does not make it less dangerous. Novelty also says little about a movement's future success–once upon a time Protestantism was a novel ideology. I encourage people to use this analogy. Think of these Salafi reformers as you do the first wave of Protestant reformers back in the 16th century. The comparison is apt not only because the goal of the Salafi-Jihadists is, like the original Protestants, to bring religious practice back to a pure and original form, or because the savagery displayed by many of the Protestant reformers was quite comparable to ISIS at its worst, but because this comparison gives you a sense of the stakes that are at play. This is a game where the shape of entire civilizations are on the table. The Salafi-Jihadists want to change the way billions of people worship, think, and live out their daily lives. ISIS's success in the Near East gives us a clear picture of exactly what kind of society the Salafi-Jihadists envision for the Ummah. I will not mince words: humankind faces few catastrophes more terrible than allowing Salafi-Jihadist reformers to hijack Islamic civilization. Theirs is an ideology utterly hostile to human progress and prosperity, and their victory, if attained, will come at great human cost. The Protestants secured their Reformation with one of the most destructive wars of European history; there is little reason to think Salafi-Jihadist victories will be any less disastrous. Not every 'great game' of international power politics is played for civilization-level stakes. But that is exactly what is at stake here. We must plan accordingly. ISIS has zero connection to Islam. The only people who think ISIS is Islamic either know nothing about Islam, are part of ISIS or write for The Atlantic. If you doubt this, please take the time to read this letter written by some of the most prominent Islamic Scholars of our time in which they go into excruciating detail highlighting the VERY Un-Islamic nature of ISIS. It is 23 pages long and in 10 different languages. P.S. Stop saying Muslims aren’t speaking out against ISIS. He links to an open letter to al-Baghdadi signed by several hundred Imams and muftis across the world, debating various theological claims made by ISIS point by point. The status started a long debate–some 40 comments long last I checked–on whether or not ISIS was indeed “Islamic” or if it was something else. Had the debate been started by anyone else it would almost seem parodic. "Of course the Islamic State is Islamic!" one wants to shout. By denying the theological underpinnings of the group and its explicit religious–indeed, Islamic–goals we deny the threat it poses and the permanent impact ISIS and Salafi-Jihadist ideology may have on Islamic civilization as a whole. Lily-liberal progressives are intellectual cowards for refusing to face up to this fact. But my friend is not a lily-liberal progressive. He is a practicing Muslim, forwarding a message written by other Muslims meant to be read first and foremost by Muslims. What those in the comment thread upset at my friend’s refusal to “own up” on the Islamic nature of ISIS could not see is that the boundaries of a religion and its attendant ideology are not set by old texts or theological debate, but by the perceptions and actions of the devout themselves. What the average American Protestant–and even more so the average American Catholic!–does to worship Christ is only tenuously connected to anything found in a Biblical text, and the lifestyle of today's Christians would be alien and scandalous to Christians of both the 4th and the 15th centuries. One age’s heretics are another age’s fellow saints. What is or what is not “Christian” is entirely determined by the perceptions, mores, and opinions of those who call themselves Christian. If the great majority concur that something is or is not Christian then, for all intents of purposes, thus it will be. As with Christianity, so with Islam. The Islamic State will be ‘un-Islamic’ once there is no one left who believes its actions are grounded in the Islamic faith. It is a hard nut for Westerners to crack. President Obama and Bush show some awareness of the problem when they declare that ISIS, Al-Qaeda, terrorism, or whatever "is not Islamic." In the end, however, these statements are self defeating. Those most tempted to join the Jihadist cause are those who will respond least well to a Christian emperor telling them how to express their faith. The crux of the problem is that we have picked a side in an ideological civil war, but the clearer it becomes that we Americans have chosen this side the more difficult it becomes for our chosen side to win. The flight of Christians away from the Near East, 1920-2006. "All the staff at the Church have been killed--they disappeared,"
The Times (23 Dec 2014). As Americans bicker as the old Islamic order burns. 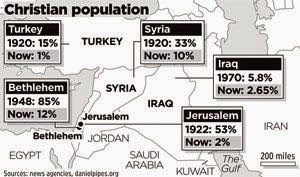 We are only in the beginning stages of this collapse and already the shape of the Arab world has irrevocably changed. 120,000 Christian refugees fled for safer lands as ISIS advanced across Iraq last year, effectively ending Christianity's 2000 year long presence there. This same sort of pressure is being placed on ancient Christian communities across the Near East. That is worth reflecting over. The arguments we have about trigger warnings and American Sniper are froth upon the wave. They will not be remembered in thirty years time. The same cannot be said for the kind of demographic and cultural changes Islamic extremists are trying to bring to the Mahgeb and the Middle East. What is happening today in mosques and madrassas across the world may shape human society for centuries. I have painted a picture in broad strokes, speaking of civilizations and centuries. That is what is at stake here. Given this knowledge I think it is appropriate to bring the discussion back down to where we started: what, if anything, can American statesmen and policy-makers do to discredit Salafi-Jihadist ideology? Recognizing both the scale and the nature of the threat helps us. We need to realize that the daily lives of billions of people around the world are being decided right now, and that a virulent ideology, not an individual terrorist group or force, is the prime enemy in this fight. This ideology will not be stopped by rational discussion or theological debate. No political or religious ideology ever has been. Victory can only come through discrediting it. However, if we transparently lend our support those within the Muslim world who argue the position we like then we discredit them. 1) We should not try to take part in the theological, intellectual, and cultural conflicts that are driving this ideology forward. American politicians making takfir are at best embarrassing and at worst destructive to out cause. Government officials should only give active support to prominent Muslims who oppose Salafi-Jihadist ideology when we can do so secretly or when our intentions for doing so can be obscured. 2) However, we should become very fluent in the details of these beliefs and these debates, even though we do not participate in them directly. It is possible to discredit an ideology without understanding it--there are few things naked force can't accomplish if applied in large enough doses. But the human costs of such a campaign would be horrific and could not be done without severely damaging the character of American democracy. Better to be smart than to descend into barbarism. 3) As we cannot discredit Salafi-Jihadist ideology through debate, we should focus our efforts on figuring out what events in the real world will discredit it and then do everything in our power to make these events happen. In his Atlantic article Graeme Wood provides one good example of this sort: if you can dislodge a Caliphate from its territory, he notes, it can no longer claim to be a Caliphate. If we properly understand the ideology that drives these men and their supporters we can find other weak points that can be exploited. (Another example, again in the context of ISIS--I would suggest that our campaigns against ISIS would have far greater power if they were perceived to be led, planned, directed, and fought by Sunni Muslims. America’s role should be muted. This will be hard to pull of given realities of current U.S. domestic politics though). 5) Related to that last point, we need to fundamentally rethink the structure of our alliance system in the Middle East. There are no good options in the Near East, and no good allies. We must settle for least worst. That is almost certainly the Iranians. It is too much to ask for an alliance with Iran, but truly, of all the important regional players they are the least dangerous. Tehran is not exporting an ideology that inspires terrorists around the world. (Indeed, outside of the Middle East itself you won’t find a Shi'i terrorist). The Persians have a stronger interest in combating Salafi-Jihadist extremism than any other power in the region. Growing Shiite power also means that more of the energy currently spent on attacking the West will be spent attacking Iran, while we can safely support Iranian ambitions without discrediting them, as would happen with many a “moderate” Sunni. This last point is radical but it may be the most important. Lately there has been a growing discussion in foreign policy circles over whether or not true U.S.-Iranian rapprochement is possible, or if the Iranians will take advantage of U.S. overtures to act against American interests with impunity. I am skeptical that the current generation of leadership in Tehran will ever be anything less than hostile towards the United States. But in the long term this does not matter. Even if the Iranians resolutely oppose every American initiative in the region the damage they might do–both to America, but really more importantly, to Islamic civilization, and by extension, to humanity as a whole--will be far, far less than out havoc our “allies” now wreck. T. Greer, "Radical Islamic Terrorism in Context, Part I," and "Radical Islamic Terrorism in Context Part II," The Scholar's Stage (9 and 10 October 2013). Seth Jones, A Persistent Threat: The Evolution of al Qa'ida and Other Salafi Jihadists (Santa Monica, CA: RAND Corp, 2014). PDF file. Brookings Institution Project on U.S. Relations with the Islamic World, "Ancient Religions, Modern Politics: Comparative Discussion of Islamic Tradition and Revivalism," Panel discussion at Brookings (20 May 2014). Transcript and audio. See also the book that inspired the discussion. "Lorenzo," Review of Your Fatwa Does Not Apply Here, Post I and Post II, Thinking Out Loud (19 and 20 February 2015). Abdul Ghella, "Tackling the New Wahabi Extremism: Africa's Menace for the Coming Years," Pambazuka News, iss. 605 (11 August 2012). Lexington Green, Comment #1 (26 February 2015) on Charles Cameron, "Definitely my 'Best Book' of 2014," Zenpundit (23 February 2015). The phrase comes from his 1795 political pamphlet, "Political Observations." I have written extensively about this quote and the historical context for it in "James Madison of War and Liberty," The Scholar's Stage (8 Oct 2010). This is of course not absolutely true--India's most serious insurgency, the Naxalites, are nominally communist. But the very fact that they are now called Naxalites instead of their official name, CPI-Maoist, is a pretty telling indication of how large a role Marxist or Maoist ideology plays in their operations. Gary Brecher, "The War Nerd: The Islamic State and American Narcisism," Pando Daily (12 February 2015). His most recent column about Boko Haram strikes a similar note: "Boko Haram and the Demon Consensus," Pando Daily (28 January 2015). This is also true, though to a lesser extent, of both the Emerati states (like Qatar) and Pakistan. The Pakistanis are a particularly dangerous lot, because they have the power to export this ideology to India, China, and Central Asia and are actively doing so. Illustration of Rashid-ad-Din's Gami' at-tawarih. Tabriz (? 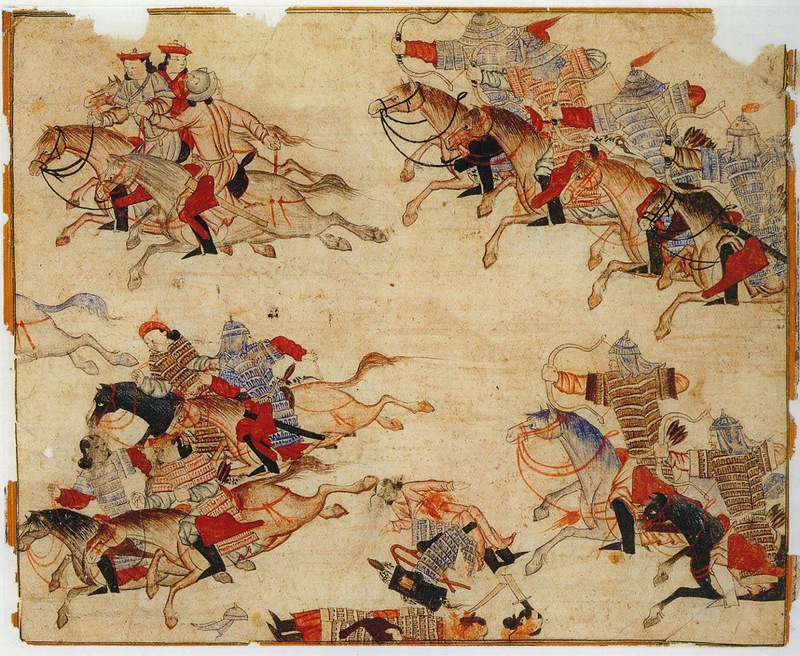 ), 1st quarter of 14th century. "One day after the suppression of the Sambyeolcho rebellion, the two comrades in arms, Koryo general Kim Pang-kyong and Mongol general Hsintu enjoyed a moment together in Kaeyong. Presently, Hsintu caught a young sparrow and, after playing with it awhile, he clubbed it to death. Then he asked Kim Pang Kyong what he thought of the performance. General Kim said: Hsintu's act would have been for the assuagement of farmer's distress caused by these birds that pecked at the grain. Nay, the Mongol said: the Koreans, like the Chinese, could read and believed in Buddha. They contemptuously looked down at the Mongols as barbarians who made a profession of killing, thinking that heaven would loathe them. But, he continued, the very Heaven bestowed it upon the Mongols, therefore they simply accepted it, and Heaven would not regard killing as a sin. That was the reason why Koreans were now made to serve Mongols." -Wanne J. Joe, Traditional Korea: A Cultural History, rev. ed. (Seoul: Hollym Corp, 1997), 207. "ISIS, The Mongols, and 'The Return of Ancient Challenges'"
In the December issue of International Studies Quarterly Paul Avey and Michael Desch published one of the more interesting articles to come from an academic international relations journal in a long while. For the last few years there has been a rather voracious debate within social science generally and political science specifically about whether or not the scholars who study these things have been producing scholarship that can be used by the men and women charged with crafting policy. Dr. Avery and Desch jump into his debate with a rather innovative approach: mass interviews and questionnaires asking policy makers what they actually think of social scientists and how they use the research social scientists produce. A full list of the people surveyed is included on pages 6-7 of their paper; it is focused on foreign policy makers, including everyone from the Secretary of State, the Joint Chiefs of Staff, and the Director of the CIA down to the undersecretaries of the various State and Defense Department regional offices. As may be expected, most of the commentary on this study has been written by political science professors and grad students about how the results of these surveys can be used to perfect their own teaching programs. More interesting to me is the picture the survey paints of America's policy-making elite. These are the folks who decide or implement American foreign policy. Who are they and how do they learn about their world? The one thing that sticks out to me from these results is that American policy makers do not read books. Some books are surely read, of course, but the harsh truth of the matter is that between their professional responsibilities and the reading burden posed by simply keeping up with current affairs most people charged with crafting American strategy do not have the time to read very many real books. The knowledge they gain from what they read during their policy-making years will be broad, but it is probably not deep. For some areas this is to be expected--ISIS has hardly been around long enough for many monographs to be written about it. But books upon books about counter-insurgency and terrorism, Islamic millenarian ideology, contemporary Near Eastern society, and the region's history have been written. Many of these books, especially those with a historical bent, cannot be reduced to a power-point slide briefing or a New York Times op-ed. And if readers of The Stage have learned anything from reading this blog, it should be that the historical and cultural context of our adventures abroad matter. We lose wars when our strategists do not know realize this, and much more besides. One cannot take this condemnation too far. There is a real limit to what you can expect policy-makers to master. No man can be an expert in all domains and it is too much to expect the Secretary of State to read three or four histories of a troublesome country every time a new crisis begins. Back when John Quincy Adams was America's premiere grand strategist and it took several weeks for letters to cross the Atlantic it was feasible for statesmen to pull off a reading spree before the trouble was over. This is too much to expect of senior policy makers in this era, who are not only expected to make time in their schedules for fancy photo ops and jet trips across the world, but often must react to crises minutes and seconds after they occur. It is a wonder these men read anything at all. One of the lessons we can draw from this is that the books and material we expect American students to read and master in the early stages of their life will have an outsized influence on the knowledge they will possess in their old age. Today's strategists survive off of what they learned when they were in school forty years ago. Absent dramatic changes in the life style of government officials or unforeseen technological developments, the policy-makers crafting strategy in 2040 will be working off of the knowledge base they are building from the books they are reading right now. One could argue that this is because academic fashion has been moving away from theories or approaches that can be used "practically." There is something to this, but I do not think it can explain everything here. James Fearon, for example, is the author of the most elegant and cogent formal model of political behavior I have yet encountered--long term readers know I am usually quite hostile to such models--and its relevance to contemporary discussion of war and peace is immediately apparent to all who read it. Of course, actual experience is a school of its own sort, and its lessons are perhaps more valuable than anything that might be found in a book, especially when policy makers are asked to resolve momentary crises on a dime. I expect that the type of background knowledge gained from the serious study of books would be most useful when planning for longer time lines--in essence, when decisions must be made at the strategic level. This is, perhaps unsurprisingly, where we see the greatest deficiencies today. Edit (20 April 2015): The title of this post was changed to make it more appealing on social media.